We've all heard the expression "Beauty is Pain". And yet, every week, hundreds of Neopians sign up their Neopets in the ever-so-famous Beauty Contest. From Faerieland to even Kreludor, Neopets from all around the globe are all in it to win it! In theory, the Beauty Contest is simple. It's true that you don't need to be a Library Faerie in order to understand how the competition works; however, this contest requires 110% effort from both the owner and the Neopet. Here to give tips and tricks for preparing for the Beauty Contest are Pyxxise the Baby Cybunny and Queen Ciprini de Beaumont, the Royal Kyrii. Both Pyxxise and Queen Ciprini have entered the Beauty Contest before in the past and have even managed to take home a few gold trophies here and there. Ciprini: So you've just found out your owner signed you up for the Beauty Contest, right? Well, it's understandable to be nervous at first, especially if this is your first time. In your head, you're probably thinking "Why in Skarl's name did my owner sign me up?" The first thing to do is relax. There is a reason why your owner chose YOU out of everyone else in your family. Pyxxise: Yes, you should be very happy. I remember the first time Angel signed me up. I was scared at first but when I found out that she thought I was special enough to enter, I hopped all the way to Roo Island! Out of everyone else in my family, she chose me! ME! *paws start thumping* Oops, sorry. I tend to do that when I'm happy! Ciprini: Hopefully your owner notified you a few days in advanced before your contest starts. That way, you'll have time for preparation. Preparing for a Beauty Contest is similar to preparing for a meeting with King Hagan. You want to make sure you're ready and give your best efforts to look at least presentable. Ciprini: In the Beauty Contest, you are only allowed to enter one photo that will first be reviewed by the Contest Judge. Depending on your owner, there may be a variety of photos to choose from. 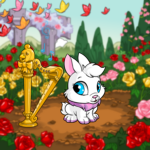 Some unfortunate Neopians only have time to take one photo of their Neopet. If you're one of the lucky few, you can help your owner choose your entry photo. Ciprini: Of course you'd know that, Pyxxise *winks*. Anyways, she's correct. A clean coat of fur is a happy coat of fur. Also remember to stay fit and healthy. If you have any allergies (like how I'm allergic to Apples), be sure to avoid them at all costs! You wouldn't want to miss the photo shoot for a visit to the hospital. Once you have been signed up in the Beauty Contest, do NOT visit the Lab Ray Scientist. If your species gets changed before or during the contest, you will be disqualified. Pyxxise:If you're a Baby, Mutant, Maraquan, or Invisible Neopet, the only thing you have to worry about is posing for the camera. Depending on your species and color, the poses are different for everyone. If you're a wee-little baby Cybunny like me, I suggest doing young poses like waving, hopping, and smiling all the time. *twinkles eyes and flashes wide smile* The cuter you are for the photo, the better your chances of beating the rest of the competition. Ciprini: If you're like me, then clothes are quite a big deal. Make sure there's not a wrinkle on your dress, not a stain on your shirt, and not a strand of fur on your pants. As cruel as it sounds, some Neopians judge solely on the clothes you wear for your photo. Be sure to verify that your outfit is appropriate for an audience of all ages. It would be quite rude to wear an atrocious outfit that scares the living daylight of everyone. You wouldn't want to miss out on a vote because of a silly thing like that. A visit to the NC Mall or the Unis Clothing Shop wouldn't be a bad idea either. Pyxxise: *coughs* Ahem, what is that supposed to mean?!?! Ciprini: You see what I mean? 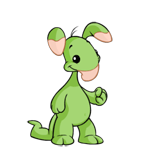 Just because you're a Baby Neopet, that does not entitle you to talk like one. Adding a young flavor to your speech is a good thing, but it's better not to overdo it with terms like "Goo goo ga ga". Pyxxise: Just because you're not a baby Neopet doesn't mean you don't talk like one either. *coughs again but more loudly* I'm going to go take a break and get some carrot juice while you share your "knowledge" with everyone…..
Ciprini: Anyhow, if you don't think you can fit all the things you want to say in the description, you can always tell the voters to look at your petpage. There's no rule against this and you can even put a better quality of your photo on the petpage since entry photos are limited in size. Ciprini: Now that the physical preparation has been completed, it is now time to get to the verbal and social part of the contest. This is the most crucial moment for every participant. Your entry photo by itself will not guarantee you a victory if nobody knows about your entry. Pyxxise: Only one word comes into my mind when I think about this part of the contest. Do you know what it is? *grins widely as if it's some sort of big 'secret'* Huh? Do you know??!? Pyxxise: I was going to say that. *sticks out tongue* Anyways, advertising your entry is the most important part. It's also the funnest part since you get to go around and talk to people about your entry. Ciprini: There are several ways of advertising your entry. Just keep in mind that only you and your owner are allowed to advertise your entry. Your owner can only advertise from the account you are living on and it's against the rules to have other people advertise for you. Also, bribing people to vote for you is as malevolent as stealing from the Snowager! If you do break these rules, there's a good chance you'll get a visit from the Defenders of Neopia to help clean up your act…. Pyxxise: In order to convince potential voters to vote for your entry, you need to be convincing, considerate, and of course, CONFIDENT. If you're not confident about your own entry, what's the point of trying to win? Ciprini: Even if you're as shy as a Symol, try your best to talk to other Neopians. You can win votes more easily if you remember to be friendly during conversations. Instead of only going around yelling around "VOTE FOR ME", talk about your entry and if the potential voter is also entered in the contest, talk to them about their entry. Don't sound too cocky or grumpy like King Snarl. It's best not to scare away your voters. Pyxxise: Remember that you only have one week to stack up as many votes as you can. So, get busy and remember the Three C's! Ciprini: This is the easiest but most nerve wrecking part of the Beauty Contest. The best thing to relax and keep it easy. If you get as anxious as I do, grab a nice cup of Borovan and munch down on some Hot Buttered Toast. Pyxxise: Also pay a visit to Roo Island and take a spin on the Merry Go Round. After all the hard work, you and your owner deserve some R & R.
Ciprini: No matter what happens, remember that you tried your best. A trophy is nice but it isn't the end of Neopia if you don't win. There's always next time.